I am sure every Malaysian goes mamak stall, at least once in the lifetime. It used to be youngsters' heaven to hangout for chit chat, but nowadays you can easily see families of few generations, from grannies to parents to kids sit on the long table to dine. And I guarantee you, there's at least a glass of teh tarik on the table, be it hot or chilled serving. I am not a big tea fan, but I do enjoy quality beverages like this, the Iced Milo by Sri Kembangan mamak stall, "Teh C Peng" (Iced tea with evaporated milk) by one of the corner restaurants located at Jalan Barat, Imbi area, "Kopi-O Peng" (Iced Black Coffee) and "Cham C Peng" (Iced tea mixed with coffee with evaporated milk) by an old kopitiam in Klang, and my most most most favorite "3 layer teh c peng" in Kuching. I damn crave about it! It's up to the extent that my friend bought me few packets and froze them, flew 2 hours to KL and I waited in airport to drink them, with the 3 layers of color contours still visible! Haha! The most expensive "imported" teh c peng! May be it's time to plan my trip to revisit. A banner in 1U caught my attention! The 3-layer teh c peng! Although I stopped for a while looking at the banner, but I was again, skeptical on its quality and the price for a glass of "teh c peng" (RM3.50 a little pricey). Well, Malay's proverb, belum cuba belum tau, sudah cuba mesti mau, never try never know, once tried sure want more, so why not give it a try? Then... I was stopped and begged not to take photos. The lady was camera shy. Haha! I have to respect her. Side by side with the menu. Tasty! Although the gula melaka wasn't as aromatic as Kuching's one, but still it has the smoothness like the genuine 3-layer teh c peng in Kuching. Oh, 1 thing very funny, I didn't see F&N milk (as per the banner) but other brand of milk was used. Hmmm... May be this was the reason the lady did not want me to take photos. 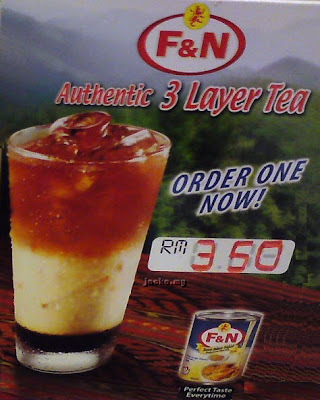 Go for a try if you have not tried before a 3-layer teh c peng or you have been long to return to Kuching, it may cure your homesickness. I just found this site. If I recall correctly, 7th mile was the shop that my friend brought me there. That's what I heard from 'old timer', the C for TehCPeng is originated from Carnation evaporated milk. Not sure how true is that. Oh, same company different branding... Thx.